Nandita Dharkar, a strikingly beautiful and talented architect, relocates to Mumbai from Delhi, seeking new horizons and compelling explanations about ghosts from her mother’s past. As she revels in her newfound independence and forges new friendships, her job at a prestigious architect firm brings suave hotelier Aryan Rai into her life—and she falls hopelessly in love with him. But when her best friend, the carelessly handsome Aditya Arora, suddenly lands on her doorstep, Nandita realizes how fickle the heart can be. In the midst of it all, she is unable to forget the mysterious letter she had discovered in her mother's jewelry box. When she embarks on a quest to find out the identity of the letter writer, shocking secrets about her mother’s past come to the forefront. Will this shatter Nandita or will she heal through forgiveness? Tender, bittersweet and moving Secrest and the Second Chances examines the fragile threads that bind a mother and daughter, and the brave choices a woman makes to follo9w her heart. 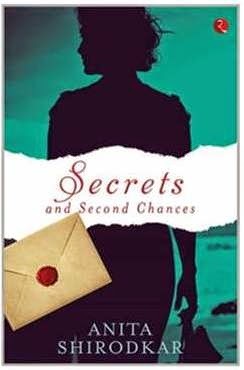 Verdict: ‘Secrets and Second Chances’ is Anita Shirodkar’s first work of fiction. As the name says, this story has a lot of secrets and when those secrets start to reveal, this story reaches new heights. The cover features a woman relaxing in her own way, looking deep and a sealed letter which I think perfectly resembles the primary importance of the story-line. This story is of a girl named Nandita Dharkar, her love life, social life, friends, her miseries and her secrets. The author had adopted a very strong narrating style which makes the story going. From the very beginning the author’s wonderful narrating style will catch the reader’s attention. The wonderfully chosen words complements the storyline neatly and those are very much reader friendly too which I think is very hard to find. The story starts with Nandita Dharkar (the main protagonist) moving to Mumbai from Delhi to make her social and academic life a bit better. Everything was falling in place when she found herself touching the success at her designing firm, finding a perfect partner in a rich and handsome hotelier named Aryan, and having a perfect social life with her new friends. But as things starts to move ahead she got the reason why her mother Amrita was reluctant to her decision to move to Mumbai. Maximum of the story unfolds around Mumbai and the author has very efficiently described the life in Mumbai. The book becomes unputdownable when Nandita starts to find the hidden secrets of her mother in Mumbai. As everything becomes normal after suffering from the crisis at the end, readers will close this book with a lasting smile. I found the storyline a bit weak in the middle. The author’s strong narrating style binds all loose ends but in the middle when Nandita was enjoying the freedom and the success, I felt the speed was dropped. Apart from those few scenes this book is as smooth as silk and will create an impact on the readers mind before they know it. Final Words: Anita Shirodkar in her debut book described one year of a lady of our time, the bond between mother and daughter and the crisis she goes through, which is more than appreciable. An entertaining read for all book lovers. Review of "The Sales Room" by "R.T. Manu Ramesh"
Review of "Twice Upon A Time" by "Anjali Bhatia"